A new setting is beginning to roll out to browser based Inbox by Gmail users. There have been lots of complaints that people didn't have a long enough time to undo a task they did because the notification disappeared too quickly. Well, as of now, you can set the notifications to stay on your screen for 30 seconds. Just navigate to the Inbox settings, Other tab. Place a check in the box next to Make notifications stay on the screen longer. 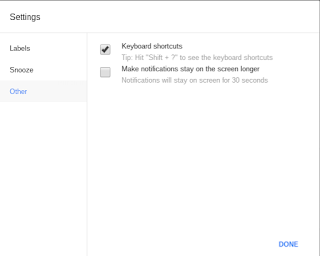 That will now enable the notifications to remain on your screen for 30 seconds, ample time to undo a mistake. Please note, this feature still does not provide for Undo Send as that is a Gmail lab feature and labs are not incorporated into Inbox as of this time.